Hey beach babes! This is Nikki from Cupcakes for Breakfast here to share a look inside by summer beach bag. 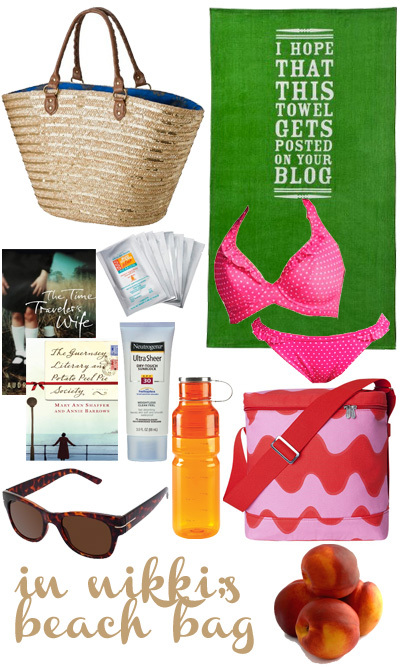 Some of my essentials include a bright bikini, a great book, cold juicy fruit, and both bug and sun protection. I'm all ready. So, when are we leaving?? Kelsey, I hope you have a great vacation! Thanks for having me! Love that towel! And that's pretty much what I stash, too. Awesome books are a must.